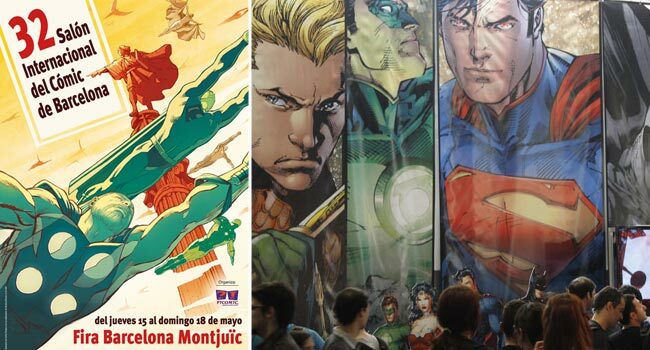 The International Comic Fair of Barcelona is back this year from 15 to 18 May 2014 at the Fira de Barcelona. The International Comic Fair is celebrating its 32th edition. This year it has chosen war as a theme to commemorate various warlike anniversaries that happen this year: the centennial of the start of World War I, the 75th anniversary of the World War II, the 75th anniversary of the end of the Spanish Civil War and the tercentenary of the end of the War of Spanish Succession in 1714. To do so, the Comic Fair has organized a macro-exhibition with more than 200 originals from authors from all over the world that will occupy all the Hall 1 of Fira de Barcelona, which has 12,000 square meters. In this macro-exhibition at the Comic Fair, there will also be live representations of historical scenes such as the Miquelets camps, the camp during the Battle of the Ebro in the Spanish Civil War or the entry of the Nine in the nazi-occupied Paris occupied during World War II. The Salo del Comic de Barcelona wants to celebrate other important birthdays –these more related to the comic theme- such as the 75th anniversary of the creation of Batman or the 40th anniversary of Marvel character, Wolverine. The Comic Fair has also prepared an exhibition about the mythical character Popeye, who celebrates no less than 85 years of its first appearance in a cartoon. Although the International Comic Fair this year has a slightly lower budget than in 2013, it has managed to invite international stars like comic writer and journalist Joe Sacco, Andrew Wildman (Transformers ) and Mike Carey (The Unwritten) from Britain, Eduardo Risso (100 Bullets) from Argentina, Audrey Spiry (Quietly) and Chloé Cruchaudet (Mauvais genre) from France, Manuele Fior (The Interview) and Pasquale Del Vecchio ( WW2.2) from Italy and RM Guera (Django Unchained) from Serbia.